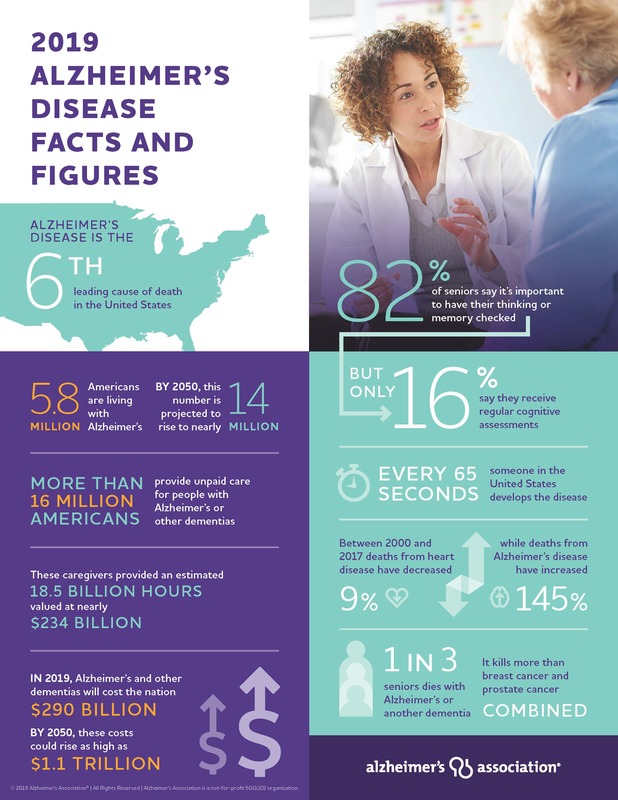 An estimated 6 million Americans are living with Alzheimer’s Disease (AD) and dementia in 2018. This number includes an estimated 6 million people age 65 and older and approximately 200,000 individuals under age 65 who have younger-onset Alzheimer’s. As the size and proportion of the U.S. population age 65 and older continue to increase, the number of Americans with AD or other dementias will grow. Data suggest that in the tristate area alone more than a million people will be suffering from AD by the year 2025, an increase of more than 15% from 2018. A recent report from the National Center for Health Statistics shows that the rate of Americans who died from dementia has more than doubled from 30.5 deaths per 100,000 people in 2000 to 66.7 in 2017. The costs associate with caring for patients with AD and Dementia are very high. In 2017, the cost of care was valued at more than $230 billion. The total lifetime cost of care for someone with dementia was estimated at over $300,000 in 2017 dollars. Despite the staggering physical, emotional and financial costs, there are no viable treatments to prevent AD or alleviate it multiple symptoms. This is not from lack of trying; since it is description in 1906 by Dr. Alois Alzheimer, the research into treatments for Alzheimer’s has suffered numerous setbacks. For example, between 1998 and 2017, 146 candidate medicines were unsuccessful in clinical trials for Alzheimer’s. In the same timeframe, just four received U.S. Food and Drug Administration approval. Moreover, these approved medicines treat only symptoms and are unable to slow the disease’s progression. Report from Alzheimer's Association provides more details (Click to get the PDF). 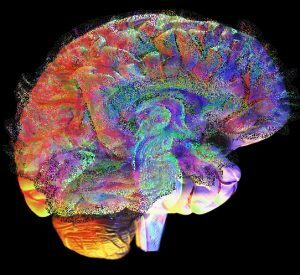 The biological underpinning of AD and Dementia is not well understood: Since the observation of plaques and tangles in the post-mortem brain tissue of his AD patient by Dr. Alzheimer’s, researchers have focused on understanding how these plaques and tangles form and how they contribute to the disease, with the expectation that treatments that reduced these plaques and tangles would prevent the disease from progressing and alleviate the disease symptoms. Unfortunately, this focus on a singular theory and dogmatic approach have yielded no efficacious treatments to date. There is an urgent need for non-dogmatic approaches to uncover the biological mechanisms that cause AD and dementia. Dr. Luciano D’Adamio and Dr. Hyung Jin Ahn are both focused on taking a non-dogmatic, unbiased approach to identifying novel biological pathways that cause the disease and its symptoms. Based on his discoveries, Dr. D’Adamio’s group has created several new and unique animal models of AD and Dementia. These new animal models are not only important for understanding the biology of the disease but also to test new therapies. These animal models are absolutely essential for translating new discoveries to the clinic; without data from these preclinical animal models, the FDA will not allow the drugs to be tested in human clinical trials. AD is difficult to diagnose: Alzheimer’s symptoms can mimic those of many other diseases, and the condition cannot be definitively diagnosed with any single lab test, scan or exam. Instead, doctors generally rely on subjective evaluation of symptoms of the disease. Early diagnosis, when potential therapies could be most beneficial, is even more difficult. Lack of reliable, objective diagnosis methods also impedes execution of clinical trials. New diagnostic and prognostic biomarkers are needed to advance our capabilities to more easily monitor disease progression and response to treatment as well as improve the rigor and efficiency of clinical trials. Rutgers is currently recruiting a faculty who has expertise in biomarker discovery and running clinical trials in AD and dementia. Identifying clinical trial participants is a huge challenge: AD and dementia present as many different disease subtypes; this coupled with the gradual progression of AD over the course of years and lack of reliable diagnostic methods, makes it extremely difficult to recruits subjects for AD clinical trials. Complicating the problem, the number of trials has exploded in recent years. For example, there are more than 100 Alzheimer’s studies looking for approximately 25,000 participants. To get these 25,000 participants, factoring in the eligibility criteria for a particular trial, referral and participation rates, and the 80 percent screening failure rate, more than 37.5 million patients in the right age group would first have to be informed! To successfully launch clinical trial in AD, Rutgers would have to expand its AD and Dementia Clinics and develop a national/international database of prescreened subjects. To develop therapies to cure AD and related dementias or, at the very least, effectively slow down the course of disease progression. To discover novel diagnostic and prognostic biomarkers that can forewarn the initiation of pathogenic processes before symptoms occur and also be used to monitor disease progression and treatment efficacy. To achieve the above goals, research at RUADRC focuses on identifying disease mechanisms using genetic, cellular, organismal and behavioral approaches in animal and human model systems. Understanding of disease mechanisms will help uncover pathways that need to be targeted by drugs to achieve therapeutic efficacy. Development of relevant in vitro and in vivo models will be important for pre-clinical evaluation of novel drugs. A dementia clinic for patient recruitment, assessment and treatment will also be needed for translating research to clinic. Component 1: Include cores for: development of novel animal models; histopathology; small animal imaging; electrophysiology; and, behavioral testing. Component 2: Include cores for: developing novel human cell model systems, such as isogenic hIPSC lines carrying AD genetic variants; high-throughput drug-screening; and immunohistochemistry. Component 3: Include a Dementia clinic and cores for: development of novel neurocognitive psychological test and novel neuro-cognitive rehabilitation approaches; human pathology assessment, human imaging; and collecting human samples (brain tissue, cerebrospinal fluids, blood/serum samples etc.). The principal investigator at RUADRC is Dr. Luciano D'Adamio, MD/PhD, Herbert C. and Jacqueline Krieger Klein Endowed Chair in Alzheimer's Disease and Neurodegeneration Research, Professor of Pharmacology, Physiology & Neuroscience and Professor of Neurology at Rutgers New Jersey Medical School and Associate Director of Neurodegeneration and Injury at the Brain Health Institute. Dr. Hyung Jin Ahn, recently joined RUADRC as a junior faculty. Dr. Ahn studies the role of cerebrovascular deficits in the etiology of AD and dementia. The Center is currently supported by multiple NIH grants and generous philanthropic support from Herbert C. and Jaqueline Krieger Klein as well as Rosalia Dattolo and Pasquale Amello Endowed Alzheimer's Research Fund established by Remember Me, Inc.